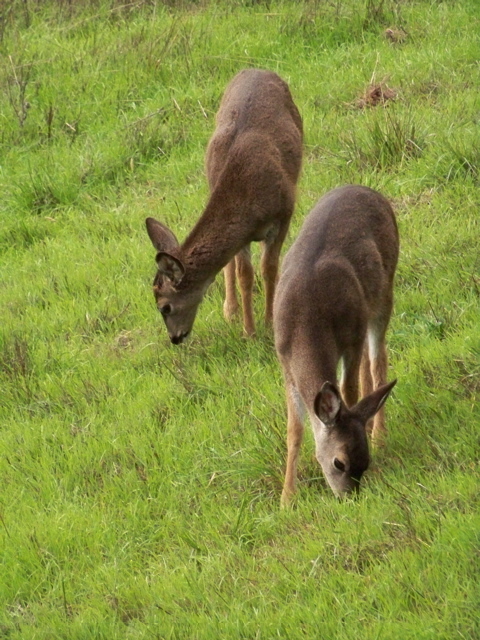 While on my deck enjoying the sun around 2 p.m. Saturday, I looked down and spotted something moving in the grass near the cars parked at the foot of my front steps. 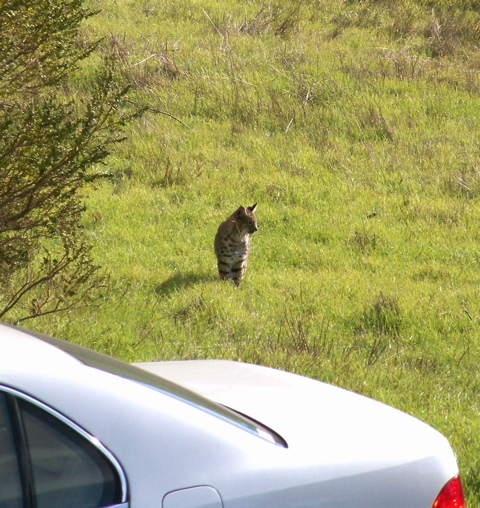 After first using a pair of binoculars to confirm that the animal was a bobcat and not just a large housecat, I quickly got out my camera. 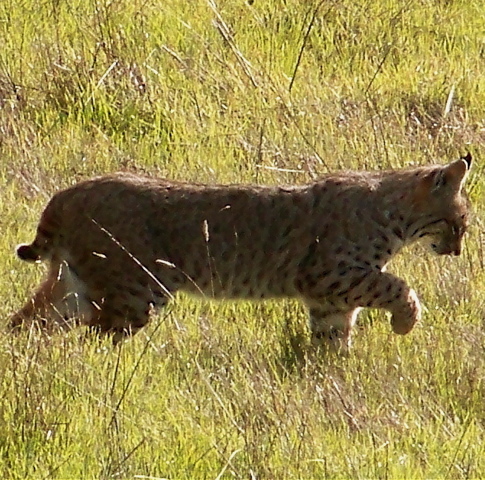 I’ve seen a bobcat hunting around my cabin before — and even shot a photo of it — but this was my first chance to photograph one at fairly close range. That was a thrill. 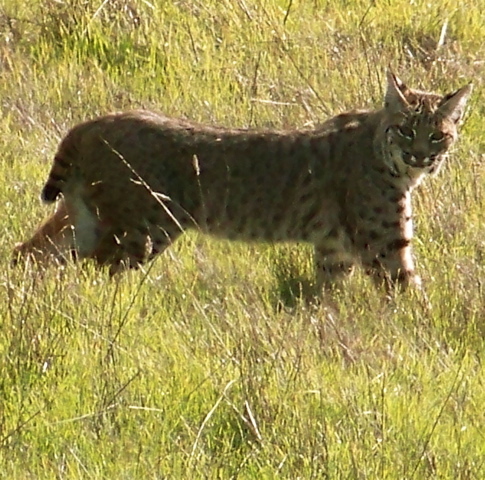 Although rabbit and hare are the primary fare for bobcats in other parts of the country, this member of the lynx genus also hunts small rodents, as well as insects, and even deer in some regions. 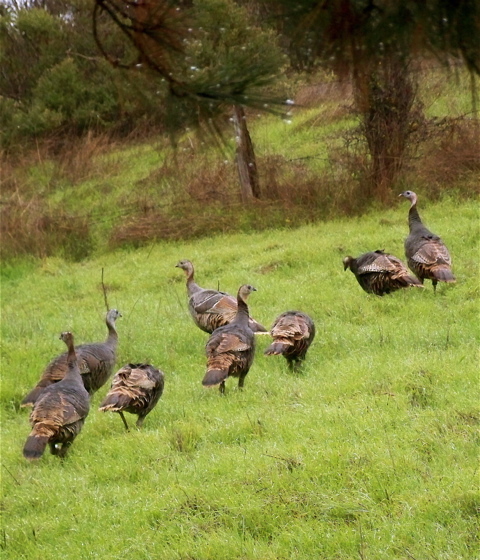 Their numbers are fairly stable in most of the United States despite heavy hunting in some places. 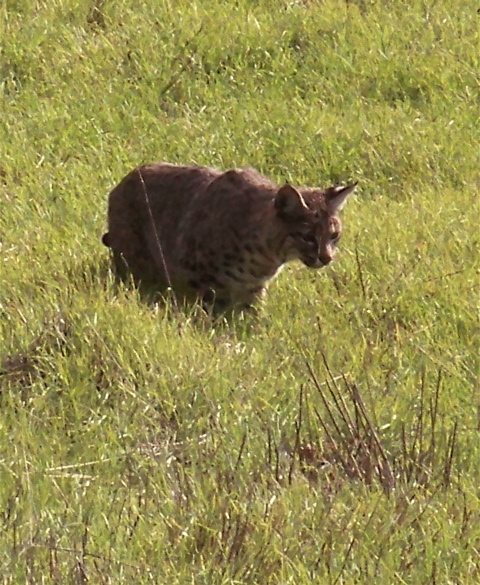 The subspecies of bobcat common to this region is the Lynx rufus Californicus. 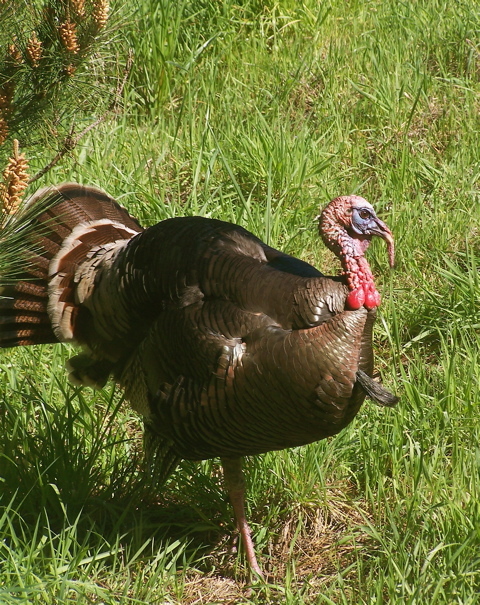 The adult male averages three feet in length, including a 4- to 7-inch bobbed tail, and is about 15 inches tall at the shoulder. 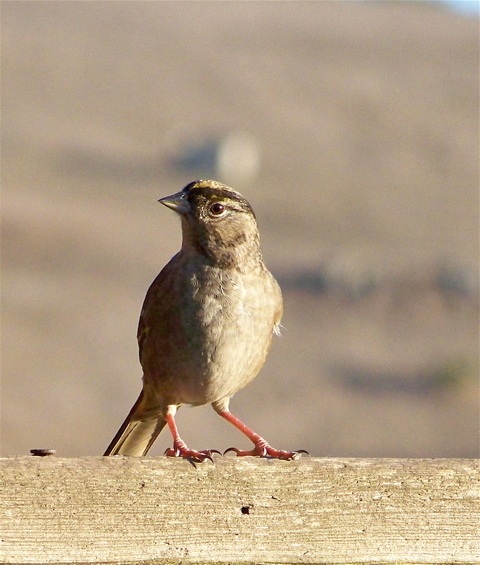 West Marin provides wintering grounds for a variety of migrating birds, and one of the first to arrive each fall is the Golden-crowned sparrow. 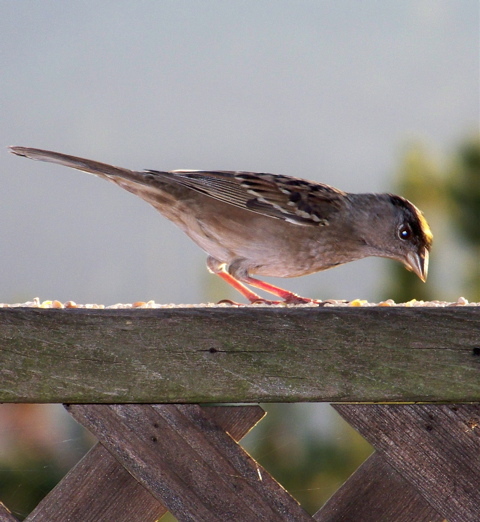 Golden-crowned sparrows’ summer breeding grounds are in Alaska and British Columbia. 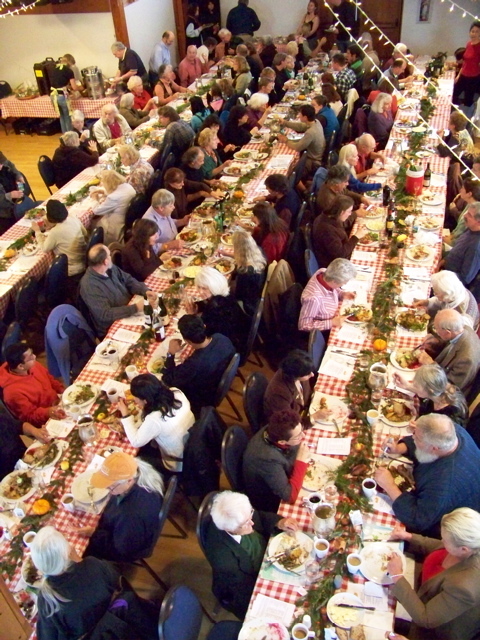 The birds migrate south to Vancouver Island and the West Coast of the United States each winter. Illegal migrants? 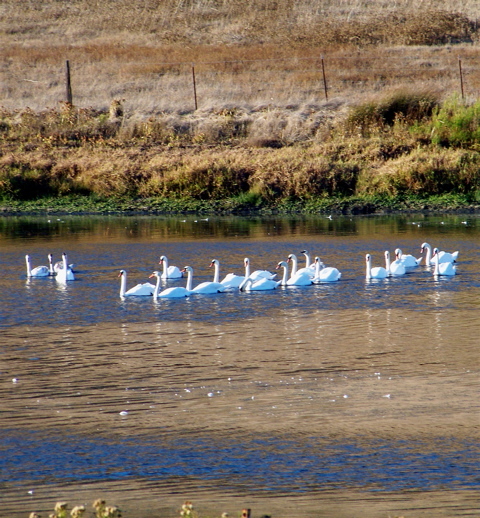 I spotted these Mute swans a week ago on La Laguna, the small lake along Chileno Valley Road near Laguna School. These are part of a larger flock that included a few Trumpeter swans. Despite Mute swans’ beauty, Oregon and Washington, as well as some Midwestern and East Coast states, have begun trying to kill them off. It’s the US Interior Department’s white-deer and Drakes Bay-oyster scandals all over again: nativism masquerading as science. The Interior Department’s Fish and Wildlife Service claims that Mute swans, which are smaller than Trumpeter swans, are non-native and eating up all the “native” swans’ food (mostly water plants, such as algae). 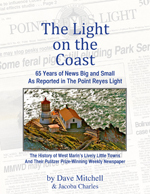 But there’s no more evidence for this than there was for the Point Reyes National Seashore’s claim that white deer were out-competing blacktail deer for the park’s abundant forage. 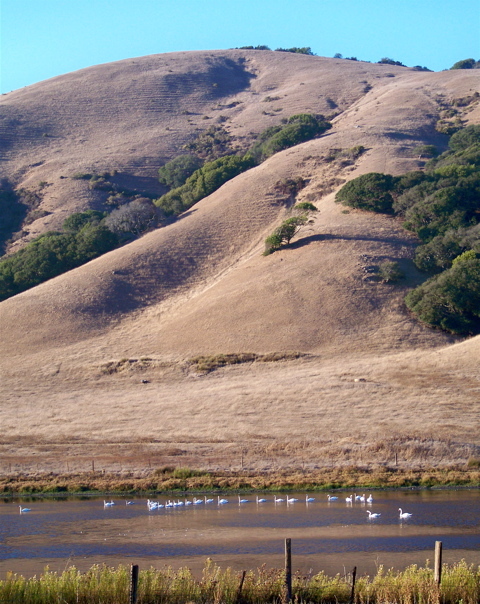 Migrant swans in Chileno Valley, which was named after another group of migrants, Chilean ranchworkers. Given their migration route, it is hardly surprising that cold weather sometimes forces migrating swans south to the Atlantic states, to the Upper Midwest, and on the West Coast as far south as California. Mute swans have been reported for centuries in what is now the United States. A 1585 scientific expedition on behalf of Sir Walter Raleigh brought back to England a detailed drawing of a Mute swan on the Atlantic shore. In short, the Mute swan is a primarily Eurasian bird whose migration routes have always resulted in some members of the species living in the United States, where the Department of the Interior now wants to kill them off. Like Tchaikovsky, I’ve always thought of killing swans as brutally misguided. If you agree, please check the Save Our Swans website to see how you can help stop this government-sponsored barbarity. A healing this nation has needed for more than two centuries has just occurred, and like many of the people around me this past evening, I’ve found my eyes periodically filling with tears of happiness. 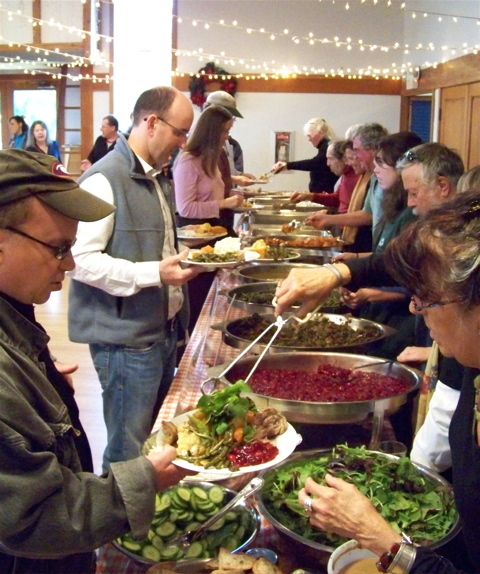 In West Marin, Barack Obama picks up 86 percent of the vote on his way to winning the presidency. 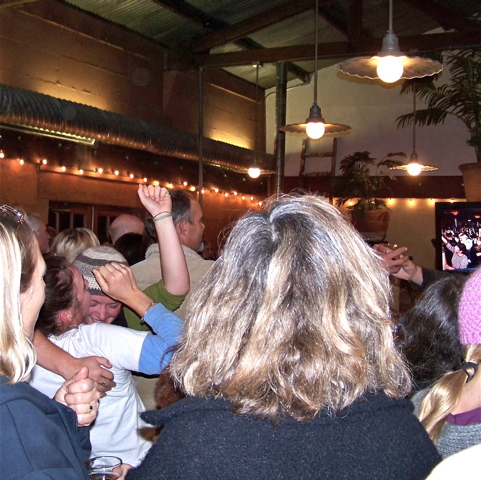 Tuesday night in Point Reyes Station, a crowd at Café Reyes joins in as televised crowds of Obama supporters elsewhere cheer state-by-state election returns. Back in the 1960s, I tried to do what I could for the Civil Rights Movement, assisting with a Civil Rights broadcast on KZSU, Stanford University’s radio station; taking part in a drive to register black voters in Leesburg, Florida, when it was still mostly segregated; and serving as faculty advisor to Upper Iowa College’s black-student union, the Brotherhood. In those days, this country’s racial divisions loomed so large I would never have imagined that within 40 years the United States would elect a black president. But Tuesday we did. Yet it is noteworthy that most Americans did not vote for Obama for the sake of electing a black president. In exit polls, almost two thirds of Tuesday’s voters said their biggest concern was the US economic recession, and a majority thought Obama could cope with it better than Republican John McCain. In short, voters were more concerned with economics than with race, and that simple fact is a wonderful indication of our country’s having matured. Exit polls found that overall a majority of whites, blacks, and Latinos favored Obama, but unlike white women, less than half of white men, 43 percent, preferred Obama. 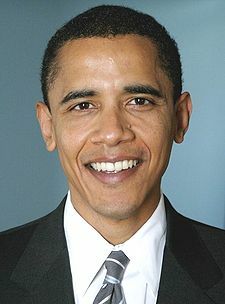 That statistic has been used to imply that many white men couldn’t overlook Obama’s being black. In fact, it shows just the opposite. Democratic candidates for president seldom do as well as Republican candidates among white men. President Bill Clinton, for example, won only 39 percent of the the white male vote in 1992 and 43 percent in 1996. Obviously, Obama’s race didn’t hurt him among white male voters. Tuesday’s election, of course, wasn’t all about race and economics. The United States is currently fighting wars in Afghanistan and Iraq. Its international reputation has been shredded by the outrages at Abu Ghraib and Guantanamo Bay. And its healthcare system is causing suffering for many Americans. For a president of any race to take all this on would be an enormous challenge, but at least Obama begins with a mandate from his countrymen and the blessings of the rest of the world. While voters didn’t elect Obama primarily to restore America’s reputation abroad, that could be the election’s most-immediate effect, as news reports from around the globe confirm. 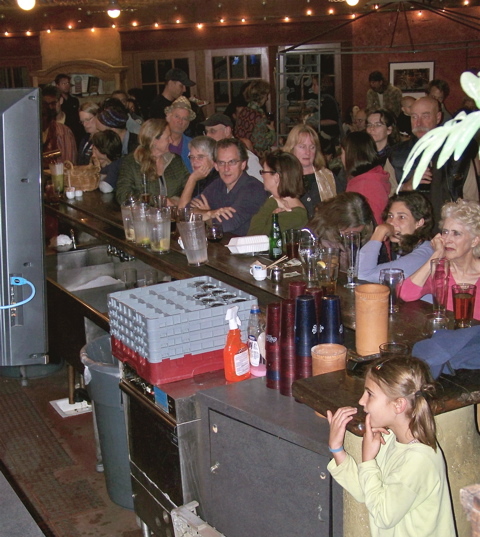 Watching television — Tuesday night‘s crowd at Café Reyes eagerly waits for the networks to declare Obama the winner, which occurs at 8 p.m. sharp, an hour after the polls close in Point Reyes Station. Bolinas Fire Protection District: incumbent David Kimball, 40 percent; Sheila O’Donnell, 27 percent; Shannon Kilkenny, 24 percent; Donald Holmes, 8 percent. Marin Healthcare District: incumbent Sharon Jackson, 30 percent; Hank Simmonds, 24 percent; Archimedes Ramirez, 23 percent; Frank Parnell, 21 percent; Peter Romanowsky, 2 percent. Measure Q (Sonoma-Marin rail district, combined two-thirds vote needed): Marin County, 63 percent yes, 37 percent no; Sonoma County, 73.5 percent yes, 26.5 percent no. Sparsely Sage and Timely is powered by	WordPress 4.9.10 and delivered to you in 0.466 seconds using 39 queries.